The Best OR Worst Way to Market Your Business. There are a lot of agencies who claim to do Search Engine Marketing (SEM), but very few who can claim to do it right. LuckyLime has developed SEM strategies that have ROIs in excess of 1000% and we have been refining our techniques nearly as long as SEM has been around. Improper SEM will leave you with nothing but an empty wallet. But a SEM strategy from an experienced team may be the best decision you’ve ever made for your business. Scroll down to learn more. Search Engine Marketing (SEM) goes by many names including Pay Per Click Advertising (PPC), paid search marketing, AdWords and Bing Ads. All of these terms refer to ads which are displayed based on a user’s search query or viewing habits. When you use a search engine such as Google or Bing, it uses complex algorithms to determine which webpages and ads are most relevant to your search term. 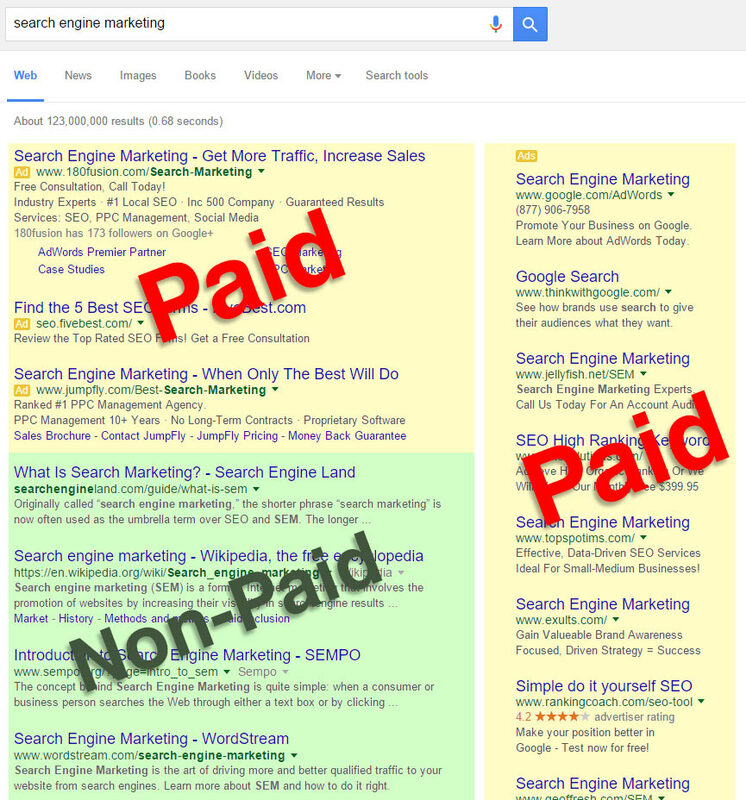 The results page of your search will contain paid (SEM) and non-paid (organic) links determined by the algorithm. When a user clicks on one of your ads, you are charged for the click based on how much you bid for the search term, the quality of your ad and the relevance of the landing page. Paid results are affected by your ad and website relevance to the search query as well as your bid amount for the search query. Organic results are affected by a wide range of factors but you cannot pay to change your rank. LuckyLime charges a one-time fee for setting up the account and writing the initial ad copy. Upon launch, we charge a monthly fee for maintaining and optimizing the account. Set-up costs and monthly fees are dependent on the size and complexity of the account. You are also charged for each click of your ad. These charges come directly from the search engine and are not marked-up by LuckyLime. You establish a budget for ad charges to ensure you know the maximum you will spend in a month. SEM can reach nearly 80% of all internet users on a daily basis. Your ads are only displayed to people looking for your specific product or service. We can control the timing of the ad, the geographic location and the recipient demographic. No other media gives this type of control. Your ads can be paused/started instantly. We use reporting tools to see which ads work best and build on them. Your account is constantly optimized for performance. LuckyLime has been performing SEM since SEM was in its infancy. We have adapted with the industry while developing our own unique approach to campaign development. Our experience has provided exceptional account performance to our clients and earned us recognition by some of the major search engines. We’ll lower your costs with long-tail keywords and advanced geo-targeting strategies. See how your campaigns are performing on a monthly basis. Your click charges are paid directly to the search engine. We focus on getting your ads in the top position. Every client has direct access to their knowledgeable and professional account manager. We do not charge more when you spend more. Request Your Free SEM Consultation.